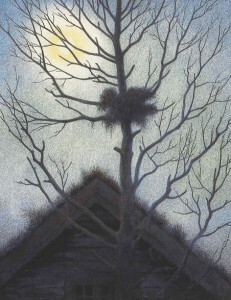 Late in the winter of 1891, Kittelsen moved to Hvitsten with his wife and daughter. He had become popular as an illustrator of books and during 1890-1905 supplied his illustrations to Johan Herman Wessel, Elisabeth Schøyen, Mathias Skeibrok, Theodor Caspari, Hallvard Bergh, amongst others, along with new editions of Asbjørnsen and Moe’s adventure series. His first, solo exhibition was made in the Florasalon in Christiania in October 1893, where his series, “Jomfruland” received its premiere showing – 15 watercolours. His other new series were: ”Glemmebogen” (1892), ”Kludesamleren” (1894), ”Har Dyrene Sjæl” (1892) and “Ordsprog” (1898). In 1894, he visited Christian Skredsvig in Eggedal for the first time. In the winter of 1896, Inga and Theodor Kittelsen leased the farm Sole at the northern end of Solevatnet. Here he completed the book collection ”Svartedauen”, which he had begun two years earlier (published 1900). In 1898, the family bought a plot of land on the hillside south of Soneren in Sigdal and in 1899 built a house with a studio, which they named “Lauvlia”.